I hope this analysis provides you with information that will both educate and prepare you to make the best real estate decisions possible in 2018. Data presented were accumulated from the GACAR MLS, FloridaRealtors.org, CoStar and the US Department of Labor through 11/29/17. Some of these statements are forward-looking and actual results may differ materially. Alachua County housing prices levitate upon strong luxury home sales and low inventory supply. Our local real estate market has unequivocally benefited from the sanguine economic backdrop that has permeated life in 2017. 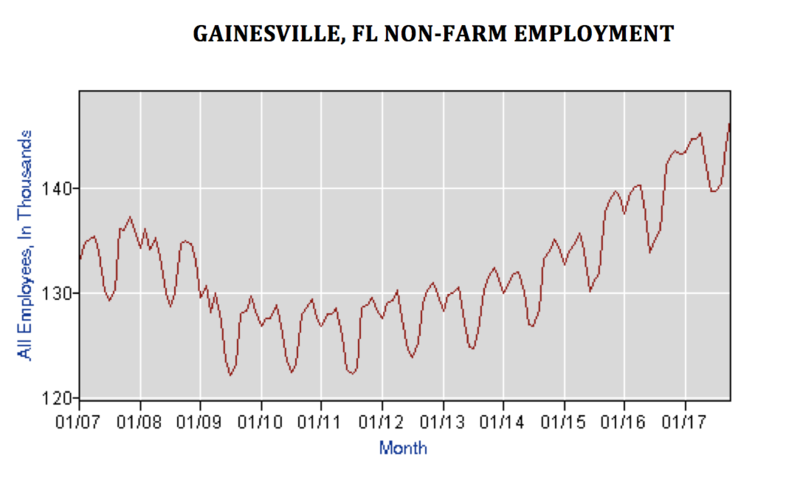 The jobs market in Alachua County has been robust with low unemployment and broad-based growth, which almost always augurs a swelling population. The S&P 500 has ascended 18% year-to-date and 401Ks and IRAs across the United States have reached record high levels. Even the crypto-currency mensas among us have extolled bitcoin as it soared from $1000 to over $15,000 this annum (beware the tulips of the 17th century Dutch Republic). One can clearly make the case that there are an abundance of favorable circumstances affecting our local and national economies. The precarious portion of our present housing equation may be whether or not household incomes can escalate at a pace commensurate with rising housing costs. It appears as though well maintained, reasonably priced homes, in highly desirable areas under $250,000 have become much more scarce. As the costs of land acquisition, impact fees, tightening subcontractor labor pools and environmental regulations mount, one has to ask, will the consumer continue to be able to bear the financial burden of rising home prices? Only time will tell. A few conclusions that may be more certain are that as long as the present economic and housing conditions persist, sellers should continue to have increasing success in this low supply, high demand environment and buyers should continue to expect competition and frequent multi-offer scenarios when pursuing desirable, well maintained properties. 2017 condo sales are on pace to be almost identical to last year with 774 units sold vs 772 in 2016. Median and mean prices rose approximately 7%-8% annually. Inventory remained miniscule at approximately 2.2 months worth of supply. Approximately 60% of buyers paid cash. There are a plethora of positives presently affecting the Alachua County real estate market. Job growth is excellent, interest rates have remained low, lenders have been relaxing their standards and credit has been reasonably accessible. This author is not prescient enough to portend if the bullish trend in our local real estate market will continue, but as Warren Buffet once said “Be fearful when others are greedy and greedy when others are fearful.” Looking forward, if you are a seller then the market is working in your favor in almost all locations and sectors, but your optimum timeline for the best marketing starts now. Please contact me at perrymcd@aol.com or (352) 262-2871 if you have any questions and I hope you have a fantastic 2018!